I'm excited to talk about 40k Kill Team and recap my experiences from the world's first major event hosted at this year's NOVA Open. Let's jump right in! It was an historic moment, the dawn of a brand new game released a mere weeks before the event, supported in a big way by the game's maker (GW), at one of the premier tabletop wargaming conventions on the planet, the NOVA Open. 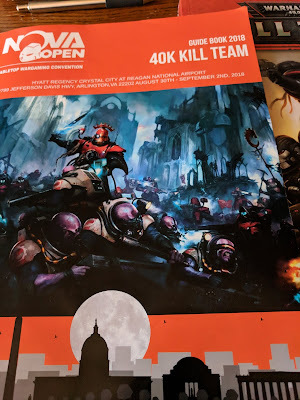 This was my 5th year attending but the excitement of not knowing what to expect from this new game/event was reminiscent of the anticipation I felt leading up to my first NOVA Open. 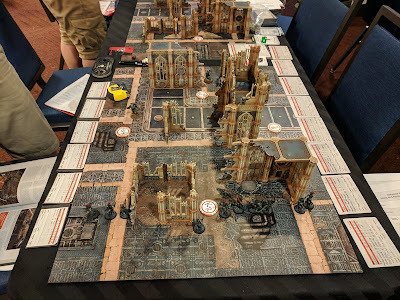 It was really cool being a part of the first organized event for Kill Team! It was professionally run right out of the gates too. I honestly wasn't sure what to expect in terms of the community reaction to Kill Team (KT). When I first heard the announcement earlier this year, I assumed it was just another iteration of previous KT releases. Then as more was revealed about the game it became clear this was going to be something bigger. I couldn't wait to get my hands on the Core Manual and the NOVA Guide Book / mission pack -- summer was busy & time limited but I dove into these whenever I got the chance, and let me say from the get go (if not apparent from the overly enthusiastic intro) that this game is a ton of fun! The type of fun that exponentially grows the more you learn and play it. I only managed to play the abbreviated intro game twice before NOVA, so not a lot of practice but I did try to prep for it. The mission pack is top notch and you can tell right away that a lot of effort went into it -- it's also freely available on GW's Warhammer Community site. 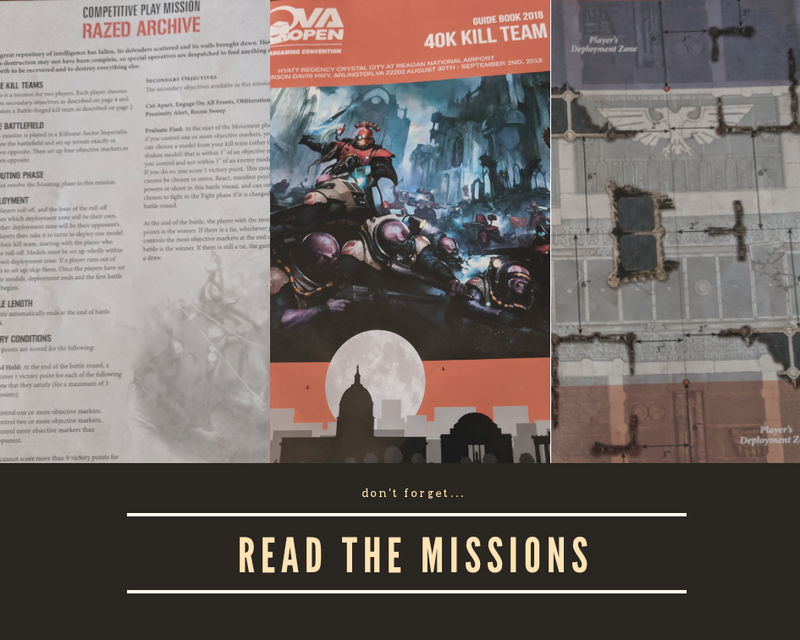 NOVA has always put an emphasis on thoughtful & balanced mission design and it was cool to see GW not only put their stamp of approval on this for Matched Play, but they also actively engaged with the NOVA crew to draw from their years experience in this arena and worked together with the game designers to make it the best experience it could possibly be. This was also a good exercise (and a lesson learned from earlier NOVAs) that forced me to read the missions and objectives before the event; this allows you to identify your best opportunities, based on your team, to maximize points as well as eliminate the ones that aren't worth going after for your particular team. 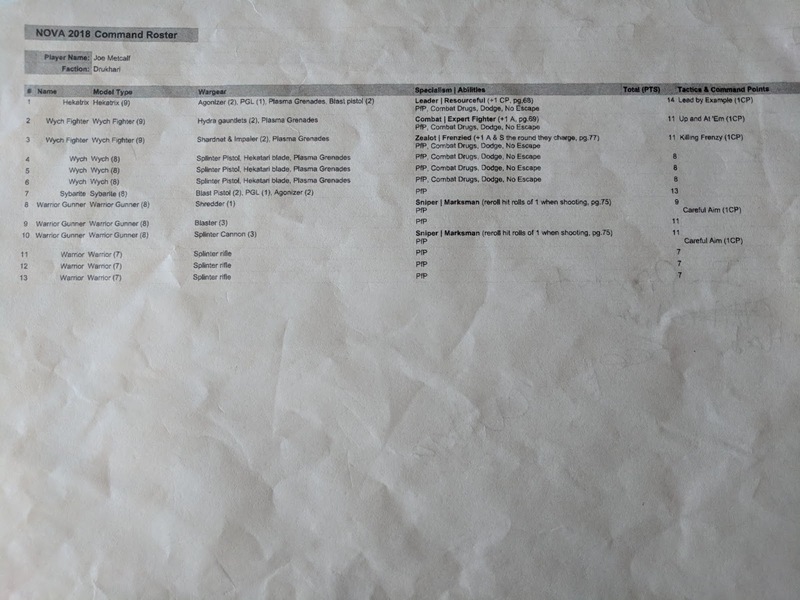 This kind of preparation is a good idea in 40k too, but even more vital in KT as you only have 5 minutes to make these decisions and record your selections on your score sheet, or else the penalty for failing to do so means your opponent makes these choices for you. Part of this prep is also identifying which Tactics (the 40k equivalent of Stratagems) you want to incorporate into your game-plan, and likewise which ones to leave at home. There's a lot of cards and tokens which help tremendously during the game but good organization is key. The cards that apply to everyone are on the top right and all I did was pick the ones I could actually make use of first, then prioritized those based on how effective I thought they could be in conjunction with my Team's abilities. The good ones went into the black card sleeves. 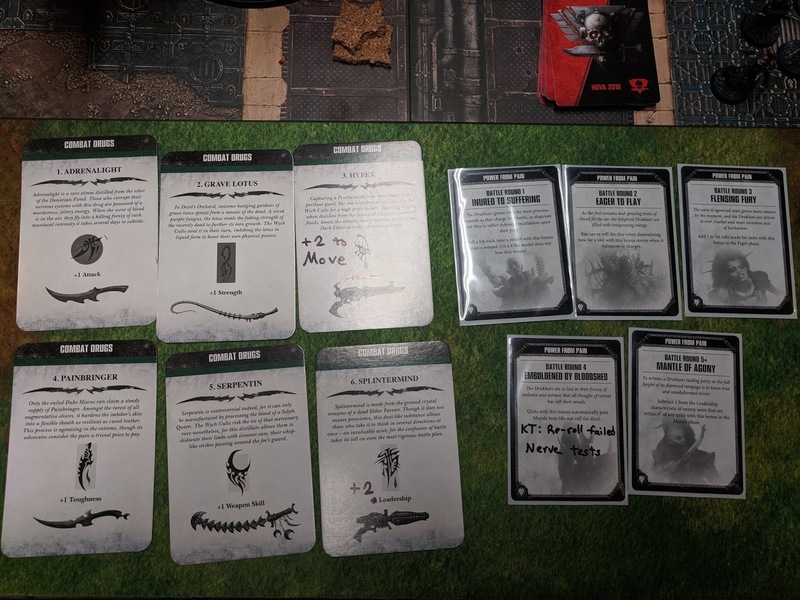 The blank cards in the Starter Set were appreciated given the short amount of time between release and event, but I wish I would have found one of those handy printable templates that some players used. An app to assist with this will be nice as the goal of not having to look things up in a book is a good one. 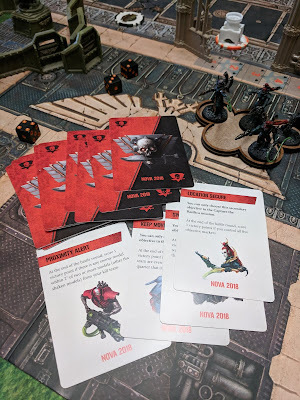 A custom deck of Secondary Objective cards, one for each listed in the mission pack, produced by Games Workshop (same exact quality cards you get in the KT Starter Set) exclusively branded for the event. Very nice! I hope GW continues to do this for other events as well. One other thing I took as a good sign of GW's commitment to the success of this game is where the event took place, front and center of the main 40k game hall and in between the 2 Twitch stream tables. 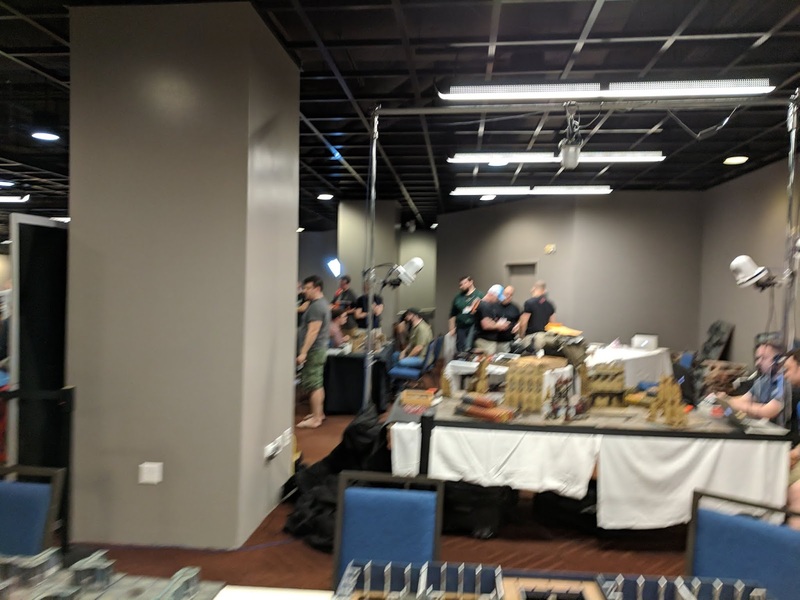 Not a good picture, but it was cool how many people stopped by to spectate and seemed to have a budding interest in the game. The terrain was awesome and every table, every board looked this good! This is partially why I failed to remember to snap pics -- the setting was engrossing and the KT gameplay very engaging. My opponent was super nice and felt about as comfortable with the game as I did, which is to say not all that much. But that's the thing, it seemed like everyone was more or less on equal footing as the game had only physically been available for a few weeks prior, so no one was super experienced. It still felt brand new (and still does) and exciting to discover a nuance or little combo you hadn't found before. This is also what made this event special; KT is so new there is no meta yet and all the best strategies and killer kill teams have yet to be pioneered. For me anyway this made it all the more exciting. Learning a bit on the fly but we had excellent judges ready to help out with any questions. But I'm honestly really impressed with how smooth it all went. 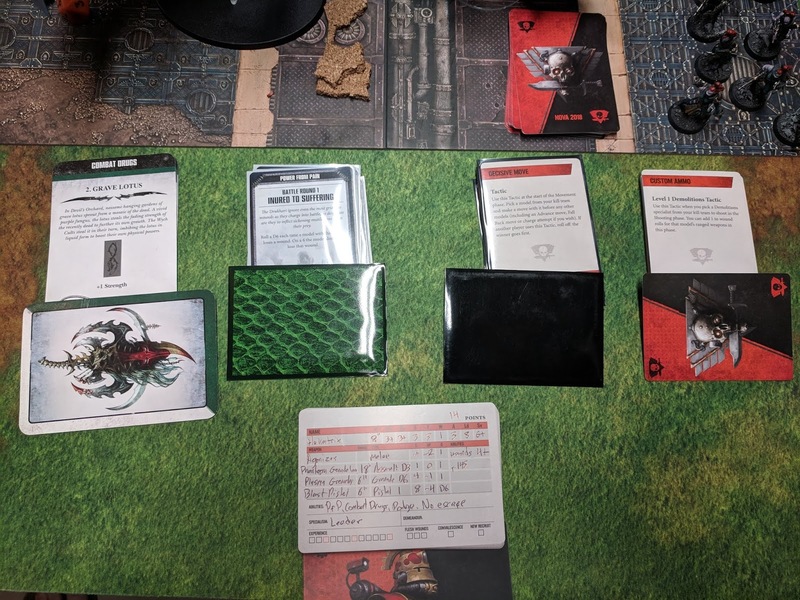 The first real game of KT, if you've played 40k prior and know those rules, will mostly be about unlearning what you think and assume will function like it does in 40k. It is best to approach KT as its own thing, because it very much is and you'll have an easier time learning it properly. It is a FANTASTIC game, but it is very important to pay attention to the details and descriptions of each of the 6 phases of a Battle Round in the core rules. Just don't assume anything is like it is in 40k. 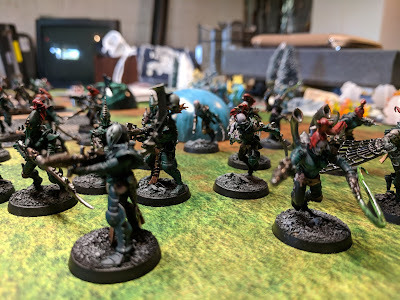 So yeah, Dark Eldar are super fast and can get where they want to go. Shredder Snipers are good and did some work in this one. 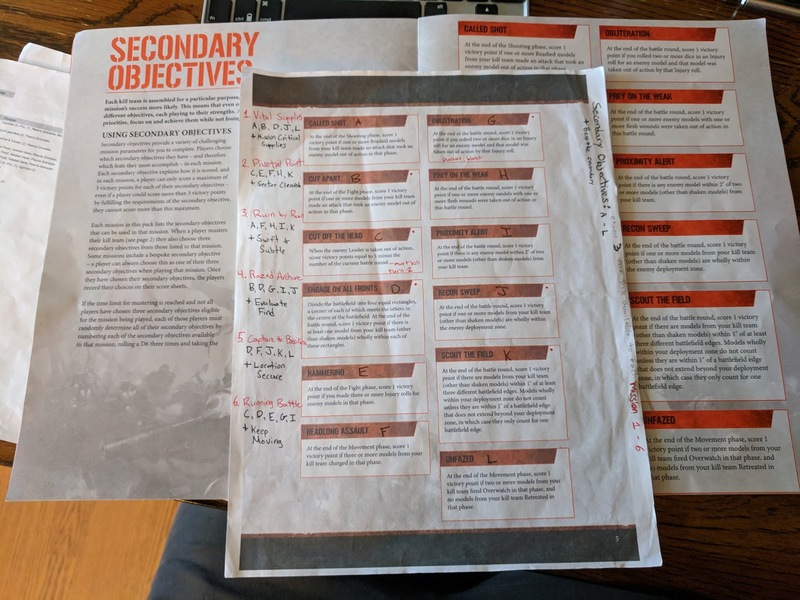 I totally botched up how to use my Leader and quickly learned I needed a new approach if I wanted to get the most out of the Lead By Example Tactic. I end up winning this one 13 - 8 due to my early jump on objectives but definitely could have swung the other way if I had failed to win combat on the center left objective. Again, I apologize for no pictures. I wish I had remembered to get at least one from each game, but alas. Game 2 was against Death Guard, piloted by another really nice guy who is local if I remember correctly. 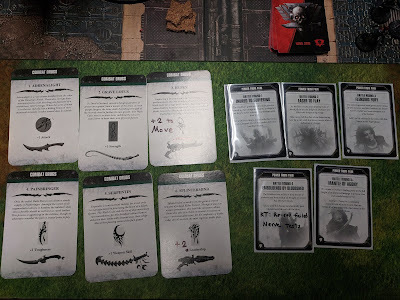 We have a great game that felt very back and forth but I just could not keep those Disgustingly Resilient nurgles down! He rolled those pretty well and schooled me as well, definitely helped me on a few pointers and I learned a lot this game as well, but ultimately lost. Game 3 was against Death Guard again, and another great opponent. By this game I was feeling more confident with the basics and starting to work more on strategy and making better choices on secondaries. We also have a very close game, felt neck and neck the whole way. And it was! We end turn 4 in a draw on primary & secondary points. Although he would have taken it if it came down to bracket advancement as I think he had tertiary. So I end up 3rd overall in my pod and I had an absolute blast! My first thought was disbelief the 3 games were over already and that I wanted to play more haha. 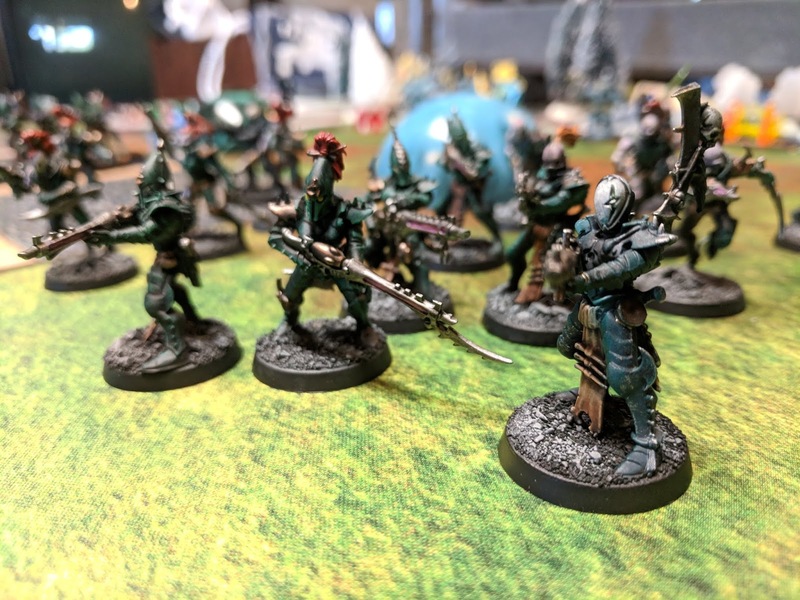 I wish I had played a little better as I would have loved to qualify to play in the finals on Sunday but it wasn't meant to be -- and that definitely worked out for the better, but I'll get into all of that on the Blood Bowl recap. Till then, go try out some Kill Team!